The field of interest of the IEEE Aerospace and Electronic Systems Society (AES-S) is the design, integration, test, and analysis of large, complex systems consisting of major subsystems that contain dissimilar electronic devices. Its members work on telemetry systems, sensor systems— such as radar, guidance, and navigation—, avionics, space systems—including manned and unmanned vehicles and communication satellites—, military systems, power systems, and auto-test systems. As such, it is one of the broadest IEEE Technical Societies. It also has perhaps the most complex history of any Technical Society. The Society began exactly 50 years ago, when a group of radio engineers got together to organize conferences on technological issues that had grown out of World War II aerial warfare, and then formed the Professional Group of Radio Telemetry and Remote Control of the Institute of Radio Engineers. Almost as long as people have been fighting wars, they have dreamt of flying. The First World War is often regarded as the first modern war, as scientific and technical research and development were consciously applied on a large scale to national war efforts, and aviation became a significant factor. But World War II saw the emergence of the electronic engineering disciplines as the keys to modern warfare. Although much historical attention has been paid to the Manhattan Project and the development of the atomic bomb, a number of special laboratories and projects were laboring furiously throughout the war, producing critical developments in telecommunications, radar, telemetry, remote control, guidance, navigation, and cryptography. Other labs worked on countermeasures to radar, navigation, and cryptography. Examples include the Radiation Laboratory at MIT, the Radio Research Laboratory at Harvard, the Airborne Magnetometer Laboratory at Columbia, the Naval Research Laboratory, and the Applied Physics Laboratory at Johns Hopkins. The impact on the war was phenomenal. 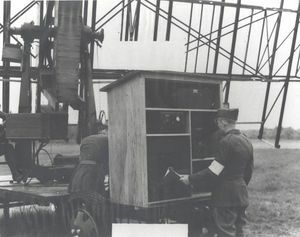 Ground-based radar was decisive in allowing 700 British fighter aircraft to defeat 2000 invading German planes in the Battle of Britain by guiding fighter pilots to their targets. Airborne radar aided pathfinding bombers in locating targets. Radar could be used to distinguish between friend and foe, so that the same unit could track enemy aircraft while leading its own home. This widespread use of electronics in warfare soon necessitated their combination into complex systems, where disparate elements performed their own functions while interacting with each other. Perhaps the first complete weapons system was the SCR-584 Four 90-mm anti-aircraft guns firing shells with proximity fuses were controlled by a high-accuracy SCR-584 10-cm ground radar unit—accurate to ±.06 degrees in angle and ±23 meters in range. The system was equipped with an M-9 analog computer for calculating the gun’s lead angle in two dimensions. The impetus of World War II, the needs of the Cold War, the U.S. postwar economic boom, and the rebuilding of Europe all combined to lead to an expansion and of electrical, electronic, and computing engineering. Although it was difficult for the West to gauge the true extent of Soviet-bloc progress, a technological competition paralleled the other aspects of the Cold War. Long-range navigation (“loran”) became possible through the installation of networks of special transmitter stations. The Berlin Airlift of 1948 was made possible by radar-based Ground-Controlled Approach (GCA) systems first tested in 1942. The invention of the transistor in 1947 further spurred growth in these fields. Engineers already active in or turning toward these disciplines could join two professional societies: the American Institute of Electrical Engineers (AIEE), founded in 1884, and the smaller Institute of Radio Engineers (IRE), founded in 1912. Originally, AIEE members were in engaged in power, industry applications, wired communication, or instrumentation. IRE was founded mainly as a home for the new field of radio, but, because of the relationship between radio and electron tubes it attracted engineers interested in all aspects of electronics. Most engineers in the newer disciplines that emerged out of the War therefore tended to join the upstart IRE, which began to grow rapidly at the expense of its older sister. AIEE had a structure that allowed for Technical Committees that had limited activities, such as editorial assistance to the central publications. The founding in 1940 of an AIEE Air Transportation Committee demonstrates the increased participation of electrical engineers in aeronautics. The post-war growth of the field led in 1947, 1948 and 1949 to a reorganization where Committees were allowed to form Subcommittees, grouped into Technical Divisions: The Air Transportation Committee became part of the General Applications Division, and sprouted such Subcommittees as Airborne Aircraft Electrical Apparatus and Aircraft Electrical Systems. At the same time, the Committee on Instruments and Measurements of the Science and Electronics Division had Subcommittees on Telemetering and on Navigation Instruments. The IRE hit upon a different, and ultimately more successful strategy; it decided in 1948 to allow groups of 100 or more members sharing a technical specialty to petition for recognition as a subsociety known as a “Professional Group.” These Groups could hold their own meetings and publish their own transactions. This strategy turned out to be a key to building IRE membership even more quickly. The first such subsociety, the Audio Group, was approved on 9 September 1948, followed immediately by the Broadcast Group. The engineers who continued to work on wartime technologies soon felt the need for groups of their own. On 30 November 1950 the first meeting was held of the tenth IRE Professional Group, the Group on Radio Telemetry and Remote Control (PGRTRC); soon after, on 15 February 1951, the Professional Group on Airborne Electronics (PGAE) held its inaugural meeting. The advent of the Cold War and the increase in civilian air traffic spurred continued development in radar and its use in detection, guidance, navigation, telemetry, and remote control. In addition to the problems of competing with the Soviets in military aircraft, missiles, and manned and unmanned spacecraft, the Western nations worked out the political and economic aspects of scheduled international air travel. 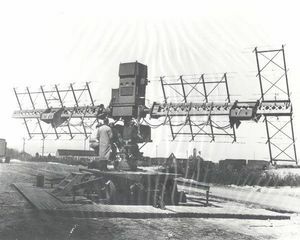 Technological advances in the early 1950s included pulse-compression radar, which achieved high resolution with the required large-signal bandwidth. These advances and others eventually led to pulse-doppler radar. Synthetic aperture, or “side-looking” radar improved the cross-range resolution. Powering these devices from aircraft engines was also a challenge that was eventually answered by the development of a hydro-mechanical constant-speed drive. These inventions led to extremely complex military systems, for example the U.S. Airforce’s Bomarc surface-to-air missile. They also allowed airborne weather avoidance and the beginnings of ground-based electronic weather observation. The rush of advances led the two IRE Professional Groups to alter repeatedly the focus of their conferences and publications, and occasionally to change their names. In 1953 PGAE became the Professional Group on Aeronautical and Navigational Electronics (PGANE). 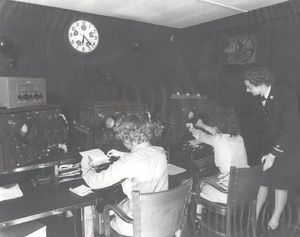 PGRTRC dropped “radio” from its title and in 1955 became the Professional Group on Telemetry and Remote Control (PGTRC). At the same time, the increasing demands of military applications as distinct from civilian ones led, in 1955, to the formation of a new IRE Professional Group, the Group on Military Electronics (PG-MIL). During a restructuring of its Technical Divisions in 1956, the AIEE likewise formed an Instrumentation Division, promoted the Subcommittee on Telemetering to a full Committee, and started a Flight Test Instrumentation Committee out of the old navigation subcommittee and others. While advances in civilian and military aviation continued, the late 1950s created a new theater for technological development and completely changed the landscape of aeronautical electronics. In October 1957, the Soviets launched Sputnik, the first man-made satellite, and the race for space had begun. The ground had been paved in 1946 when a team from the Army Signal Corps bounced a radar beam off the moon and detected the echo. Although originally justified by military uses and national prestige, the communications and navigational uses of space soon became obvious. For example, although Sputnik broadcast only a beacon signal, it was discovered that its Doppler shift revealed the position of the observer. Within the United States, although the Department of Defense continued to receive a great deal of funding for both air and space electronic research, the National Advisory Committee on Aeronautics (NACA), in existence since 1916, became the civilian-based National Aeronautics and Space Agency (later Administration)—NASA! The electrical and electronic professions also changed their names to reflect the new directions. In June 1959, the AIEE Flight Test Instrumentation Committee became the Aerospace Instrumentation Committee (ASIC). Two months later, the Air Transportation Committee became the Aerospace Transportation Committee (ASTC). Over at the IRE, in March 1959, PGTRC became the Professional Group on Space Electronics and Telemetry (PG-SET), and less than two years after that PGANE became the Professional Group on Aerospace and Navigational Electronics (PG-ANE). On 12 April 1961 the Soviets sent Yuri Gagarin into space, after which U.S. President John Kennedy pledged that America would put a man on the moon by the end of the decade. The complexity of space systems needed for manned flight dwarfed even that of the most sophisticated military systems of the 1950s. For example, telemetry had to be expanded to include not just instrument signals but the vital signs of the astronauts. Radar could help lunar landers determine their altitude and velocity relative to the surface and surface. Ground-based digital computers calculated trajectories to precision far beyond what had been possible with analog computers. At planetary distances, one has to account for the finite speed of light. On manned missions particularly, space-borne digital computers performed attitude control. They permitted new functions to be done on-board, such as telemetry and redundancy management. One of the greatest technological achievements of all human history took place in July 1969 when Neil Armstrong and Buzz Aldrin set foot on the moon. The unmanned exploitation of space for telecommunications had begun with bouncing signals off the moon, and by the end of the 1950s people had heard U.S. President Eisenhower’s pre-recorded Christmas message, broadcast from the SCORE satellite in 1958. In 1960, the ECHO balloon was launched to replace the moon as a passive communication relay. TIROS I, the first weather satellite, and Transit, a navigation satellite used by the U.S. Navy to aid submarines, were launched in the mid 1960s. TELSTAR, a commercial venture by AT&T, reached orbit in July 1962 and demonstrated real-time active communication via satellite, including the first transatlantic television broadcast. These technological breakthroughs led to important international political developments in the sharing of space and spectrum. Geosynchronous orbit as a method for global communication had first been proposed by Arthur C. Clarke in 1945. Early Bird, the first Intelsat satellite, began the era of geosynchronous satellite communications in 1965. The 1960s also saw the first unmanned planetary probes, with the launching of Mariner 2 on 27 August 1962, and ground-based radiotelescopes first listening for evidence of extraterrestrial intelligence. Meanwhile, the technological , demographic, and economic trends of the 1950s brought about political changes in the engineering profession. In 1963, the IRE and the AIEE merged to form the Institute of Electrical and Electronics Engineers (IEEE). The new Institute decided to maintain the group structure of the IRE. PG-MIL, PG-ANE, and PG-SET all became Professional Technical Groups of IEEE. At the same time, the engineers of the AIEE involved in these fields felt that they would not have equal status within IEEE if they did not have their own Professional Technical Group. So, immediately upon the merger in January 1963, the former members of AIEE ASIC and AIEE ASTC joined forces to form the IEEE Group on Aerospace (G-AS). The technical overlap of the four Groups, enlarged by the growth of the aerospace industry, soon became apparent, however, and in 1965 they merged to form the Group on Aerospace and Electronic Systems (G-AES), which in 1973 became the full-fledged IEEE Aerospace and Electronic Systems Society. The increased capability of digital processing that began in the late 1960s accelerated in the 1970s, bringing still further change to aeronautical, astronautical, and military systems. In radar, wide-band VHF permitted subsurface imaging, while the U.S. Air Force developed its Airborne Warning and Control System (AWACS), capable of complete aerial surveillance of air traffic over battlefields. The development of sophisticated data buses—a technology which later spilled into ever corner of the civilian sector—allowed increasingly complex systems to interact, leading to the F-16, the first fly-by-wire aircraft. That is, electrical signals actuated the control surfaces, allowing, among other things, the pilot to cope with tremendous G-forces. On the civilian side, air travel safety continued to improve as vehicles became increasingly automated. Building on the success of Loran, the U.S. Navy began orbiting precise clocks, known as TIMATION, as a navigational aid. Then, based on TIMATION and Transit, the U.S. Department of Defense implemented NAVSTAR GPS—and the Soviets later developed the analogous GLONAS. These Global Positioning Systems have revolutionized navigation, military and civilian, from ships to spacecraft and everything in between. Meanwhile, having lost the “Moon race,” the Soviets focussed on maintaining manned space stations in orbit for decades, beginning with their Salyut Program. The United States, having won the race by sending a few manned missions to the Moon, launched its own space station, the Skylab, in 1973, built from left-over Apollo hardware. The 1980s saw the escalation of technological competition between the United States and the Soviet Union, followed, at the end of the decade, by the collapse of the Soviet system which has led, ironically, to greater cooperation but less public funding in both countries. At first, the 1980s witnessed increased military spending in the United States and a tremendous growth in civilian air traffic, due in part to deregulation of the airline industry. A particular impetus to aerospace research was U.S. President Ronald Reagan’s call for a satellite-based missile defense system, and the Soviet response. As a result, the AES-S became the fastest growing IEEE Technical Society in this period. In 1986, the Society began to publish IEEE Aerospace and Electronic Systems Magazine, to complement the more detailed IEEE Transactions on Aerospace and Electronic Systems. The major technological thrust continued to be the use of computers, microprocessors, digital signal processing (DSP) chips, and other specialized electronics in every aspect of aerospace engineering. More powerful signal processing rendered radar a more powerful tool than ever, and combining multiple radars in a single unit revolutionized weather forecasting for instance. Military aeronautical advances continued with the development of stealth technology. 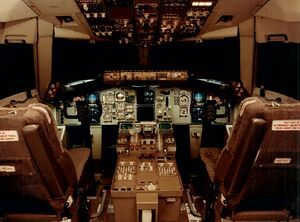 On the civilian aviation side, The Boeing 767, introduced in 1982, used computers and electronics to such a degree that pilot and co-pilot alone could fly it, and the flight engineer was eliminated. Computerization also led to more efficient use of fuel. In space, NASA’s ACTS program demonstrated onboard signal processing with data rates on the order of hundreds of MHz, multiple hopping beams, and 30 GHz band technologies. On the manned side, the United States retook the initiative with the reusable Space Shuttle. The Soviets countered in 1986 by launching the space station Mir, which was to break all space endurance records; later it came to symbolize the cooperation of the 1990s. Satellite-based wireless communications also continued to grow in the 1980s and boomed in the 1990s, with the introduction of a number of commercial systems, although not all of them were financially successful. The impact of GPS continued to grow, affecting even automobiles. Unmanned probes continue to travel into the far reaches of the cosmos, and scientific and weather satellites continue to orbit the Earth. Manned and unmanned space missions came together dramatically in the last week of the 1990s, when a Space Shuttle crew repaired the ailing Hubble Space Telescope. The 1990s of course saw the retrenchment of the aerospace industry in many countries and a concomitant slowing of the growth of the IEEE AES-S. But the end of the 20th century found air and space travel and the complex electronic systems that make them work to be healthy, integral aspects of society. The technological accomplishments of the engineers of the AES-S and its predecessor organizations have positioned the Society to play a leading role in the third millennium, during which flight and space travel will set and achieve new goals. Predecessor Groups and Societies of AESS. On January 16, 1973, the Group on Aerospace and Electronic Systems became Aerospace and Electronic Systems Society. In 1965, G-Mil, G-SET, G-ANE & G-AS merged to form Group on Defense and Navigational Systems and subsequently changed its name at its March 18, 1965 meeting to become: G-AES: Group on Aerospace and Electronic Systems (or also referenced as Aerospace and Electronic Systems Group). On January 36, 1963, the 1st meeting of the G-AS, originally titled: Aerospace Institute Technical group was held which initiated the Group's formation. Name change to: Professional Technical Group on Aerospace (PTGAS) on August 5, at its initial meeting with new name. Name change to: Group on Aerospace (G-AS) on July 28, at its initial meeting with new name. On November 30, 1950, the 1st meeting of the IRE Professional Group on Radio Telemetry and Remote Control (PGRTRC) was held which initiated the Groupo's formation, and subsequently changed to: IRE Professional Group on Telemetry and Remote Control (PGTRC) on August 26, 1955, at its initial meeting with new name. Name change to: IRE Professional Group on Space Electronics and Telemetry (G-SET) as of March 25, 1959, its initial meeting with new name. Name change to: The Professional Group on Aeronautical and Navigational Electronics (PGANE) as of September 29, 1953, its initial meeting with new name. 7 Predecessor Groups and Societies of AESS. This page was last edited on 30 July 2014, at 19:11.